Post-war Italian art is very much in vogue. ‘La Bella Figura’, Max Wigram Gallery’s first historical show, opened the week after Christie’s sold a major collection of arte povera and Sotheby’s included works by Alberto Burri and Lucio Fontana in its contemporary sale. All this follows recent London exhibitions of major figures at Tate Modern, the Estorick Collection, Camden Arts Centre, Whitechapel Gallery and the Serpentine. La Bella Figura, a common Italian phrase referring to the importance of maintaining an elegant exterior, may seem to point to the often poignant beauty of the works, but it also refers to Italy’s ugly political underbelly, the implied corrupt core that ‘the beautiful figure’ must disguise. 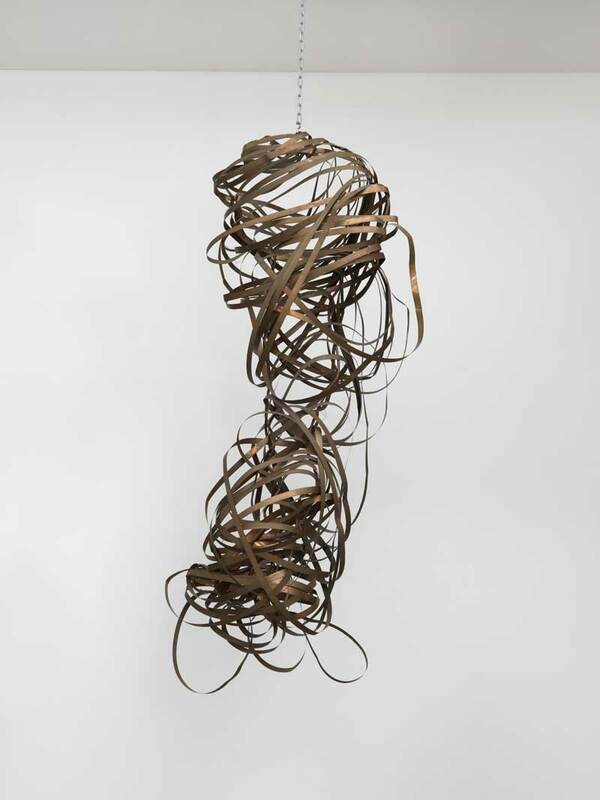 Luciano Fabro’s imposing Italia Feticcio (1981), a tangled mess of copper ribbon loosely forming the infamous boot shape of the Italian peninsula, hanging from the ceiling in the first room of the exhibition, most clearly evokes this tension between chaos and charm in a country which has seen 63 governments in fewer than six decades. The exhibition’s inclusion of works by Fontana and Pier Paolo Pasolini may seem like a simple bringing together of two greats of post-war Italian culture, but it belies complex political tensions. Pasolini’s films are highly critical of Italian politics and consumerism, whereas Fontana’s punctured and slashed Concetti spaziali, as the catalogue reminds us, can be associated with the American anti-Communist support of Italian art related to Abstract Expressionism. Fontana and Pasolini are far from the only big names in the exhibition. 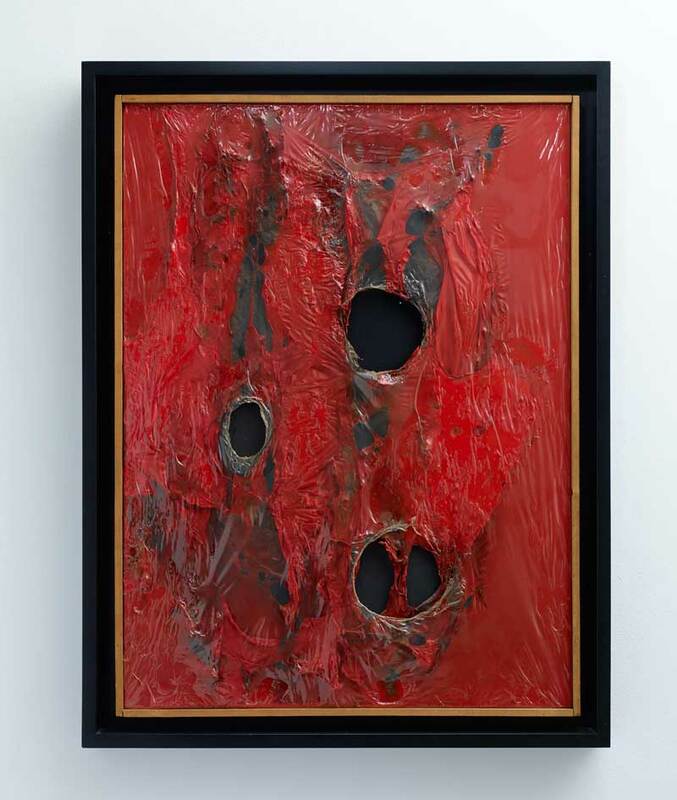 Burri and Piero Manzoni are represented by characteristic works, both from 1962: for the former a Rosso plastica with three holes burnt through the plastic layers to expose black Celotex, and for the latter an Achrome made of polystyrene balls. For other artists, the works are representative, but lesser-known: the figures in Pistoletto’s mirrors are fibreglass and bronze sculptures, rather than painted onto the surface; Boetti’s maps are serigraphed rather than embroidered; Castellani’s textured white surface is paper rather than canvas. The show also introduces some artists who are lesser-known in London. 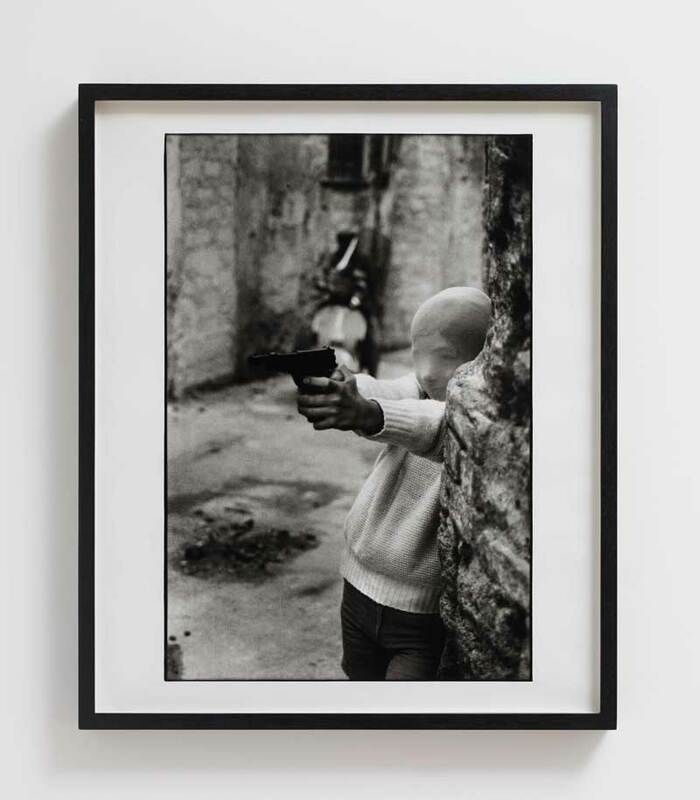 The most engaging pieces by the new names are Letizia Battaglia’s exquisite photograph of a Sicilian child playing with a gun, Afro Basaldella’s energetic abstract painting and Mario Ceroli’s wooden silhouettes of the Riace bronzes. The inclusion of Carlo Mollino’s beautifully crafted walnut chairs, as well as Pasolini’s films, draws attention to the range of Italy’s post-war cultural output. By highlighting some of the lesser-known figures of post-war Italian art, and engaging with the complex and ugly world of post-war Italian politics, Bjorn Stern has curated a refreshing take on the Bel Paese, which doesn’t let style detract from substance. ‘La Bella Figura’ is at the Max Wigram Gallery, London until 22 March 2014.